The following was inspired by Bob Denham’s post of December 15, 2012. Janice Kulyk Keefer is a Canadian writer of Ukranian-Polish descent, born in Toronto in 1952. She studied at University of Toronto, and took her Ph.D. at the University of Sussex, England. From 1982-1989 she lived in Nova Scotia, where she taught at the University of Sainte Anne. Following her Nova Scotia sojourn she returned to Ontario, and now teaches at Guelph Unversity. She is a poet, novelist, short story writer, and critic, and the winner of many awards. In 1987 she published, with UofT Press, Under Eastern Eyes: a critical reading of Martime fiction. In her “Polemical Introduction” she tells the story of the unfortunate neglect that Maritime writing has suffered, the cause of which is Central Canada’s self-absorption and arrogance. The villain in the story she tells is Northrop Frye. Central Canada has also dominated our literary history, thanks largely to the magisterial myths set down by Northrop Frye. Invoking the Laurentian Drang nach Westen “that makes the growth of Canada geographically credible,” Frye fashions his own paradigm of Canada as discovered by the literary imagination. The garrison mentality, the “Laurentian paradigm” of Canada, the “looking-glass land of The Anatomy of Criticism” – it all comes under attack. Keefer goes on to quote (though not in its entirety) the Jonah and the whale passage from Frye’s “Conclusion to a Literary History of Canada,” the final essay in The Bush Garden. Canada began as an obstacle, blocking the way to the treasures of the East, to be explored only in the hope of finding a passage through it. English Canada continued to be that long after what is now the United States had become a defined part of the Western world. One reason for this is obvious from the map. American culture was, down to about 1900, mainly a culture of the Atlantic seaboard, with a western frontier that moved irregularly but steadily back until it reached the other coast. The Revolution did not essentially change the cultural unity of the English-speaking community of the North Atlantic that had London and Edinburgh on one side of it and Boston and Philadelphia on the other. But Canada has, for all practical purposes, no Atlantic seaboard. The traveller from Europe edges into it like a tiny Jonah entering an inconceivably large whale, slipping past the Straits of Belle Isle into the Gulf of St. Lawrence, where five Canadian provinces surround him, for the most part invisible. Then he goes up the St. Lawrence and the inhabited country comes into view, mainly a French-speaking country, with its own cultural traditions. To enter the United States is a matter of crossing an ocean; to enter Canada is a matter of being silently swallowed by an alien continent. “Canada has, for all practical purposes, no Atlantic seaboard” is the bee that stings. It’s not just wrong, but offensive, to Keefer’s thinking. Though Frye seems to be stating the obvious, that the United States has ten of millions up and down its Atlantic coast, including major cultural centres, while Canada has a few hundred thousand, Keefer doesn’t see it that way. The Jonah paradigm betrays the strength of Frye’s commitment to fictions of the centre, and hence his distrust of, or at least ambivalence towards, regions and margins. Though Frye’s most recent remarks on regionalism in Canadian letters are collected under the heading “From Nationalism to Regionalism: The Maturing of Canadian Culture,” he seems to have come to prize regionalism not as a good-in-itself, but as a means of depoliticizing culture: “the conception of Canada doesn’t really make all that much sense. ‘Canada’ is a political entity; the cultural counterpart that we call ‘Canada’ is really a federation not of provinces but of regions and communities … What Frye ends up talking about is a kind of metaregionalism which has little to do with the specific political, social, and economic realities which give to the various regions of Canada their significance and vitality. In the end, after several more pages of this, what the reader is faced with seems more like a rant than thought-out criticism. Something about Frye annoys her, so much so that she has trouble seeing him clearly, or wanting to see him clearly. Perhaps it’s the fact that he grew up in Moncton. Nova Scotians, as I learned from experience living in Halifax for 24 years, find it hard to conceive that much of anything of value could come out of New Brunswick, especially out of Moncton. At this phase of Frye’s thinking, that specific environment implied the concept of nation. A Canadian poet who consciously tried to “avoid being Canadian” would have sounded “like nothing on earth” because “poetry is not a citizen of the world: it is conditioned by language, and flourishes best within a national unit.” Because of Canada’s specific historical, political and cultural development, a Canadian poet had to choose his creative locus from among three possible environments – the imperial, the national and the provincial. The imperial, because of its abstract nature, and the provincial, because of its narrowness and inwardness, were both, according to Frye, “inherently anti-poetic environments,” and the poetry they inspired was conditioned by “the colonial in Canadian life. However, Frye would soon abandon this tripartite concept of the Canadian context and replace it with a binary one – the regional versus the national, whereby the regional was regarded as the real source of the poet’s imagination. While the imperial and the provincial were altogether dismissed, the national fell into the category of opposition to the regional. In his reading of Frye, Gorjup traces the development of this binary concept (national versus regional) and shows how it frees Frye to understand and value the genius of Canadian literature. The region, as Frye frequently repeated in these essays, was the only true home for the imagination, although many writers from various parts of Canada would produce a body of literature that would be felt by both Canadian and non-Canadian readers as “distinctive of the country.” At the heart of this distinctiveness was the link between context and text or, as Frye called it, an “imaginative continuum” that would keep both defining and redefining the representation of the writer’s experience of Canada as a physical and cultural environment. It would be difficult for a student of Canadian literature to grasp fully the complexity of contemporary Canadian writing without exposure to Frye’s illuminating inquiry into its earlier stages of development, when the writer’s key preoccupation was still with the conception of feeling genuinely at home in a new country. And to feel genuinely at home, Frye observed, the writer had to humanize or – mythologize – the environment; he had to transform it imaginatively through cultural representation. And writing was the most compelling way to do so. The interfacing of context and text, as Frye saw it in Canadian writing, generated a distinctive literary production, which facilitated the first major step toward a national literature and, eventually, toward the liberating realization that literary standards can only be made, not met. This entry was posted in Uncategorized on January 5, 2013 by Ed Lemond. The paper was delivered at the Frye Festival on April 21, 2001. 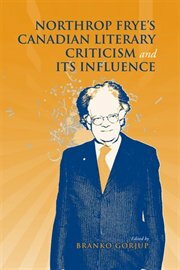 An extensively expanded and revised version of this paper appeared in Northrop Frye’s Canadian Criticism and Its Influence, published by University of Toronto Press. It’s good to be reminded about how Frye changed his views on Canada and Canadian literature over the years. There are people besides Keefer, such as Robin Mathews, who get somewhat intemperate when writing about Frye’s views on Canadian literature. It is true that Frye’s view of Canadian literature changed, but only when the cultural landscape changed in the 1970s, when with writers like Atwood and Munro it became a literature of international stature. With this Frye’s view of its literature naturally became lesss derogatory. Other than that, the basic views remained the same. As Ed Lemond’s post shows, there is a strangely personal testiness in Canadian literary critics and scholars when it comes to Frye’s writings on the subject, a readiness to misunderstand and project–it is like a susceptibility to slight which makes them almost incapable of reading what he actually says, a susceptibility, I think, due to a lack of detachment from the subject matter and an almost inveterate need to cheerlead. The silly nationalism of Robin Matthews is a case in point. As Eleanor Cook has noted, you would be very hard put to find a Canadian critic or scholar who could actually provide you with a fair summary of what Frye actually argues in his now notorious introduction to the Literary History of Canada.